Country music band Parmalee will be the headline entertainment for the 2018 Columbia County Fair performing two shows Sunday, Sept. 2 at 3 p.m. and 7 p.m. on the Main Stage in front of the grandstand, according to John Craft, Entertainment Committee Chairman. Sponsored by the Hudson River Bank and Trust Co. Foundation, the concert is free with paid admission to the fair, $15 for adults on Sunday only. Comprised of brothers Matt and Scott Thomas on lead vocals and drums, cousin Barry Knox on bass and their best friend Josh McSwain on lead guitar, Parmalee is the quintessential American country band. Named after the small town where the band started in Parmele, North Carolina (population 278), the chart-topping quartet pays homage to their humble Carolina upbringing with their name and their sound. 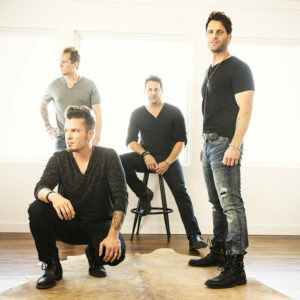 Raised on a diet of southern rock, country and blues, Parmalee formed in 2001 as a bunch of small-town boys chasing wild weekend nights, but their talents eventually took them onto country music’s biggest stages and to the top of Billboard’s country chart. The band’s blue-collar persistence made their 2013 breakout single, “Carolina,” into a Platinum-certified number 1 hit, while their debut album landed in the Top 10. Two more singles, “Close Your Eyes” and “Already Callin’ You Mine” rose to number 3 and number 10 on Billboard’s Country Airplay chart. Parmalee’s most recent album, 27861 was released in July 2017 and saw two singles, “Roots” and “Sunday Morning” enjoy chart time on Billboard’s Top 40 Country Airplay chart and have seen more than 30 million combined streams on Spotify.